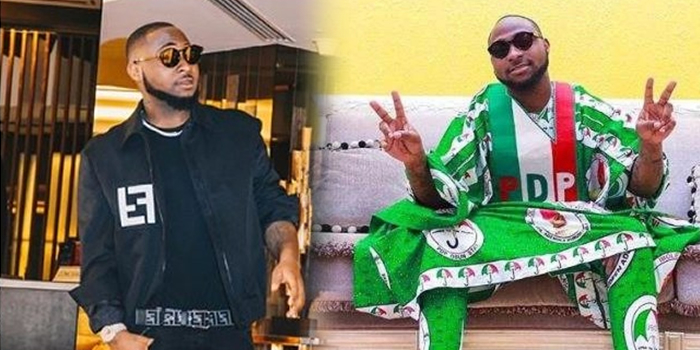 It was earlier reported that Davido has been actively championing a discourse about the upcoming 2019 presidential election. He took to enjoining Nigerians to defend their votes. But even more, he addressed his fellow entertainers and asked them to speak out as they were powerful enough to subdue all forms of electoral oppression. Davido’s series of tweets on this matter has since gone viral and has generated a lot of reactions among fans. One lady in particular raised a very strong argument meant to counteract the singer’s claims of solidarity for Nigerians. The lady identified as @Angel_phase on Twitter remarked that, despite Davido’s political activism, he has not, for once supported his colleague Banky W who is running for a political post. Due to the fact that Davido has not tweeted in support or in endorsement of Banky W’s political aspiration as a member of the House of Representatives, the lady was forced to conclude that the popular musician did not actually care about politics. Many people have since taken to replying this tweet made by @Angel_Phase. Some people were in support of her while others strongly negated her assertion by saying the 26-year-old singer had a right to his opinions and decisions. Just because Banky w is his colleague doesn’t mean he has to support him,you endorse competence not necessarily who you know..
You guys just like to place labels on people. @iam_Davido is quite very open about who he is supporting. He doesn't have to support who you 'think he should support' or who you are supporting to show that 'he cares'. What if he doesn't believe in BankyW's capacity to deliver. Why should he support Banky if he doesn’t believe in him, is he not entitled to his right of choice? Banky was tactically supporting the abuse of our constitution the other day and you want us all to support him because he’s a musician and a youth? Doesn’t work like that mate. This is coming after the popular singer took to thanking his late mother for always protecting him. According to him, only an angel like her could have made his dreams come true.